Okeducation Truths and Rob Miller threw out the challenge – I am picking it up. Reasons for despair and hope in education. Its hard to be a teacher. Working to reach every student every day is very difficult. It can be like wrangling cats – these students seem to be all over the place! By the time you have them moving in a general direction the day ends. This is usually a really enjoyable experience, but there are days when it is hard. Most days are exhausting yet fulfilling. While herding the cats, teachers also are busy planning lessons for the future. Sometimes that future is a few weeks away, sometimes that future is tomorrow! Planning a lesson is not something that occurs in a five minute chat over coffee and donuts. It takes time. What is the learning objective that needs to be met? What supplies need to be purchased? What copies need to be made? Do the students need some sort of pre lesson activity? If so, what kind? How will the lesson unfold? What will the opening activity be? How will students show what they learned? What kind of formative assessment (this is where teachers informally check the learning process) will be used? What are the state learning objectives that are being met by the lesson? What are the key things that will be tested at the end of the year? Will I be able to reserve the computer lab/cart for this lesson? If not, what needs to be changed? How will I grade each student? Have other teachers done a similar lesson? If so, can I use what they did and tweak it to fit my students? What will the independent practice look like? Will there be homework? Do I expect parents to help? What do I need to document for my administration? There are other pieces here that I left out, but I hope you see that this is a process. Quality lessons take time to build. While herding cats, writing lessons, and grading, teachers also need to communicate with parents how those students are doing. This can sometimes be a difficult conversation. Getting help from parents is critical in the success of students. It takes time to have these conversations and successfully communicate all of the things that need to be communicated. Calling 150 parents takes time. Lots of time. While herding cats, writing lessons, grading, and calling parents, teachers also need to keep an eye out for policy that is being created by our elected leaders. This is difficult because teachers are so busy teaching – combing through the legislative pieces and trying to understand what the potential impact of each piece will be is hard. Then trying to email or call each of the elected leaders on all of these bills is hard. We just want to teach. Teachers work hard – they give everything they have, every day. I have yet to meet a teacher who didn’t care about the students. Some are more passionate than others – but none of them every made the statement “I am out to ruin these kids and the educational system.” Yet there is a persistent undercurrent of thinking from certain groups that this is what teachers do. Teachers are super heroes. Teachers work miracles everyday. Teachers want to have the freedom to teach back in their control. This is a bunch of despair…. Teachers work so hard to be the best that they can be for their students! Reading the different blogs from Oklahoma educators gives me such inspiration. These people take time to share what they are doing, to share what they believe, to build each other up! I am a different teacher now than I was when I wrote my first blog post (it was terrible…). Completely different. Why? Because of the educators who poured into me without knowing they were doing it. If you tweeted, facebooked, pinned, blogged, instagrammed, or edcamped over the past several years – you made a difference in my teaching! That gives me hope! Such power in this herd of amazing people! There are so many rules that box teachers in and I guess that some of those rules are probably necessary. However, I did not know that there were so many educators that were banging down the walls that were holding them in. The ideas that have been shared through the different social media outlets are so incredible, its hard to wrap your mind around them all. Mystery Skype? Where was this when I was a kid! Classroom Twitter debate? What?! Paperless Classroom? Crazy talk…And this is just to name a few. The brilliance of teachers to be able to work all of these cool things into lessons AND work inside of the box at the same time is a testament creative thinking that teachers are sharing. #Oklaed – the power of this group is just incredible. I have had the good fortune to meet so many of you over the past couple of years. The trading of ideas and sharing of struggles makes us who we are. You have helped me with my graduate work, you have given me feedback on papers, you have encouraged me, you have shared your time with me, some of you fed me! Go back a just a couple of years ago with the Sunday evening chat and compare it to the dynamite that happens now. My TweetDeck just spins like a slot machine! So.Darn.Amazing! Students – I spent 18.5 years in the high school classroom and now am starting my second year in the college classroom. Every time I am around students I get a buzz! Students want to learn. They yearn to learn. They can be stubborn – it can sometimes be like selling a commodity to a buyer who has no interest…but…They always buy. Every time. I am currently working with our future teachers and this makes me so excited! These students will be our peers and colleagues in such a short period of time. They are bringing such enthusiasm and passion with them – it gives me hope for the future of education in our state. Joy Hoffmeister gives me hope. She is visible. She listens. She works tirelessly for educators. She is doing all she can to make positive changes from the top. Thank You Joy! 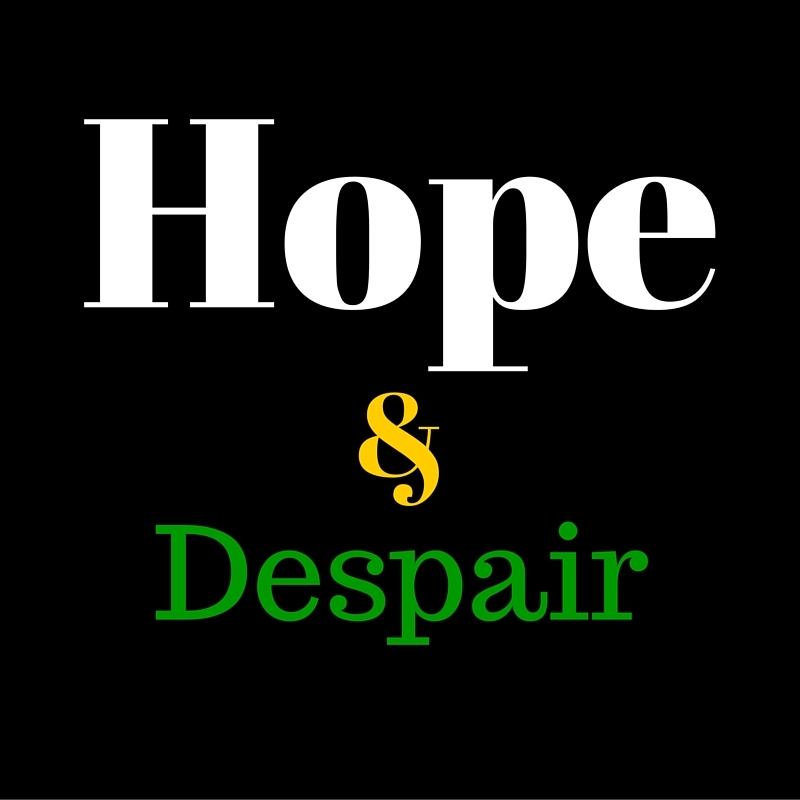 4 Responses to "Despair and Hope in Education"
Have to get away from grading. And grading. And grading. … Won’t save that much time but the impact of meaningful feedback, revision, and effective learning will make it all worth it! I’m surprised and dismayed, really, that in your litany of chores we face preparing for our students, you have omitted any reference to collaboration and the work we do together as members of our professional learning communities. I find that the more we work together, the greater our hope and the less our despair. When I think back on the work you did collaborating with Christina as you prepared for math classes at EMHS, I don’t remember much despair … just hope. We are doing tough work, but it is joyful work. Don’t believe everything you read! You are correct – that was completely unintentional! Working with Kristina is the catalyst that sparked me into my current place. Without the collaboration between us and the support we got from you as our admin, I wouldn’t be here today doing what I am doing. I am more thankful for you two than you guys will ever know. You now have me thinking about editing this part – I rarely despair when I am at school, teaching, working with colleagues, and doing any of those things. My despair comes from so much hard work done by teachers going unnoticed by those who should be aware. Several of those people have the ability to show the world what teachers do, they can be openly supportive of what we do everyday. You have me thinking on a new post with your comment…. Much better! Remember to get out of that ivory tower!